This list was created by the great u/totallynotabeholder. Thank you for your hard work! A flock of ravens, circling around and around a fixed point on the ground. A Giant Eagle, with something glinting in its talons. A cloud that appears to be moving in the opposite direction to the prevailing winds. A Harpy, burdened with a large urn cradled carefully in its claws. An inquisitive Brass Dragon, with a terrible sense of humour. A long piece of rope, which seems to be dangling from hole in thin air. An Aarakocra patrol, tracking an escapee from the Elemental Plane of Air. A Gnome on a home-made hang glider, frantically trying to work out how to get down. A weird glowing orb, about 3 ft across, moving and stopping at irregular intervals. A dark rain cloud, which appears to be keeping pace with something on the ground. A Flying Sword, hanging motionless in the air. A Flying Carpet, riderless but with what appears to be a bulging satchel on top of it. A collection of Flumphs, undergoing what appears to be a mating ritual. A swarm of Sprites, making huge signal patterns in the fading evening light. A column of dark smoke, rising up from an isolated village. A display of fireworks, marking a celebration. An Imp, painted with runes of binding and carrying a sealed scroll. An Air Elemental, injured and having difficulty maintaining height. A Djinni, moving directly towards you with purpose and at speed. A plume of greenish-blue gas, emanating from a Wizard’s tower. A Chimera and a Manticore, engaged in furious aerial battle. A Pseudodragon, with a tail tag and broken leather leg cuff. A collection of balloons, moving of their own volition and making strange noises. A pair of Silver Dragon Wyrmlings, practicing their breath attacks. An invisible sphere hanging in the sky, miles in diameter and slowly spinning. A Broom of Flying, drifting slowly with goggles and a leather helmet strapped to it. A large levitating stone platform, hidden from the ground by a cloud like illusion. A collection of Mephits, which appear to be frantically fleeing something. A migration of Cockatrices, flying to warmer climates. A ring of Quadrones, holding hands and rotating slowly around a point in space. A stone thrown by a Giant, whistling by REALLY fast. A pillar of white light, rising towards the heavens from a source on the ground. Dancing lights, twitching and moving erratically in the sky. An Elf riding a horseless, flying chariot, leaving fiery tracks as it moves. 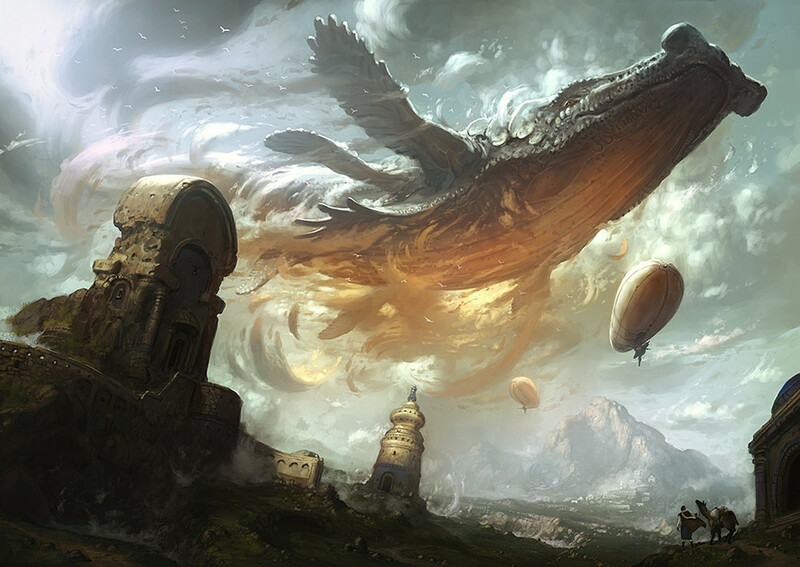 The drifting wreck of a large airship, listing and with claw and teeth marks all over it. A Roc carrying a live cow back to its nest for its chicks. A fierce electrical storm, with flashes of lightning projecting the silhouette of a humanoid. A Wizard, trying out his home-made Boots of Levitation. Hundreds of Gas Spores, slowly rising higher into the atmosphere. An unnaturally tall tree, rising out of the canopy of a forest. Several meteors, maneuvering all by themselves. A portable hole, suspended in the air with the sound of deep breathing coming from it. An Efreeti and a Marid, floating along arguing about a glowing stone carved with runes. A narrow, jagged rift to the elemental plane of air, with an arm reaching through it. An avatar of Remnis, god of Giant Eagles, lazily cruising on the breeze. A druid, flying along on a large and roughly worked piece of stone. A Storm Giant flying tower, seemingly abandoned. An Elf riding a Griffon, armed and armoured for battle. An Orc on a Wyvern, with a bow and an empty quiver. A Pegasus, flying calmly and fitted with a saddle and armour. A group of scared looking nobles in a hot air balloon. A merchant flying along on a magical carpet, towing their wares on a giant Tenser’s Floating Disk. A company of Dwarves, huddled together in a giant doorway in the middle of a cliff face. A collection of brightly coloured flags and streamers, planted around a black stone box on a snowy mountain top. A floating stone face, that will allow you to ask it any three questions. Two elderly mages, racing brooms around a tree top course marked by ribbons. A small yellowish toxic cloud, that if attacked becomes the mist form of a Yochlol. A flock of Gargoyles, taking off from a dark, decrepit fortress. A huge humanoid made of clouds, intelligent and conversant but with no clue about its origins. A carrier pigeon bearing a magic coin, being attacked by a hawk. A cloud of Sprites, chattering and arguing about a missed opportunity. A flock of magical books, speeding in all directions away from ancient ruins. Several Will-o’-Wisps, bobbing up and down excitedly at the top of a looming, ancient marker stone. A slender 90 ft spire of a brass-like material, slowly rotating and pushing up from the earth. A malfunctioning wand, gyrating through the air and firing Magic Missiles at random directions. A rainbow bridge into the sky, slowly fading but with the distinct tang of magic from the Astral Plane. A Winged Kobold, asking piteously if you have seen which direction his tribe went. A Homunculus, scouting out partially ruined tower of burned and blackened stone. A Pegasus, teaching its foal how to fly. A column of rising and expanding steam, with a pair of singed Gnomes underneath surrounded by wreckage. A weirdly glowing, stationary cloud that whispers as you approach it. A swarm of annoying biting insects, rushing ahead of an unusual storm front. A hawker’s gyrfalcon, flitting from tree to tree and ignoring the calls of its master. A pair of Imps, squabbling over an oversized dagger with a green gemstone in the pommel. A Young Green Dragon, flying slowly and obviously badly wounded. A series of tiles floating and tumbling in the air, each bearing runes in Jotunuvar (Sky Giant language). A Green Hag on a barely working Flying Broom, crashing into everything in its path. Two Harpys, flying near the ground and carrying a brass bound chest between them. A royal messenger, wearing winged boots and carrying a wax-sealed scroll case. An unusually persistent dust devil, playing havoc with a travelling caravan. The image of a crown, projected by unknown means onto the base of nearby clouds. A raven flapping lazily along, with a leather hood and a message scroll tied to its leg. A wooden chest supported by dozens of tiny wings, heading very intensely in a straight line. Smoke signals, being made by a barbarian Orc tribe. Thousands of tiny wildflowers floating into the sky, released from the head of a Dryad. A Wasp construct, slightly larger than life and made of precious metals, bearing a maker’s mark ‘K.T.E.’. A Skywrite ritual spells out the words: BARRIER GONE, THE WAY HAS BEEN OPENED. A Wind Wall spell across a small valley, holding back a creeping finger of coloured fog. A Faerie Dragon, chasing what looks to be ball lightning. A haughty Dragonborn Wyvern rider, with a bound Orc prisoner slung across the back of his saddle. A young Human male, being born unwillingly along on wings sprouting from his back. A Djinni at leisure, lounging on a cloud and being served by a bonded Jann. A Sylph, travelling to a rare sylphmeet. A fading Air Elemental, bound to protect the body of a fallen Elven prince. An eccentric Cloud Giant runemage, reinforcing the glyphs holding up a magically solid cloud. Three black clad Gnomes, riding Giant Owls in daylight but hoping to remain unseen. A stunned looking Goliath, sprawled at the centre of a whirlwind. A Giant Bat, carrying the remains of an armoured humanoid in its claws. A small airship, with a captain and crew that obviously have no idea what they’re doing. A priest using Wind Walk for the first time, equal parts terrified and determined.